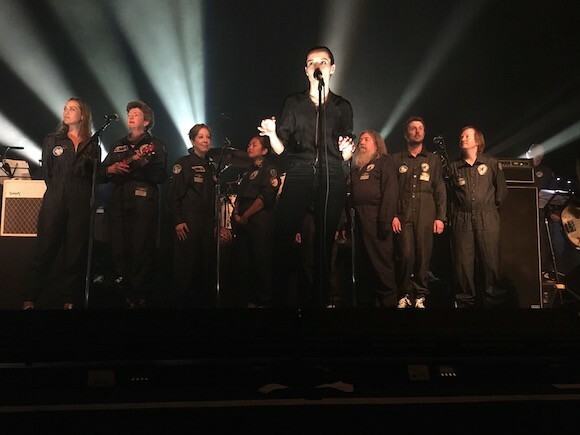 The International Space Orchestra and rock band Savages played on the 19th April at the famous Fillmore Theater in San Francisco. Spinning Platters has reviewed the concert, describing the Savages as as delivering ‘one of the most ferocious and stunningly energetic performances of 2016‘. And speaking of the contribution of the International Space Orchestra they go on to say, ‘ What followed was a truly breathtaking finale to an evening that had all but managed to drain the life force of everyone crammed against each other at the Fillmore that night, with the massive orchestra adding an other-worldy collage of sound to “Mechanics” and the titular song “Adore” for the end of the show’. Spinning Platters is a music-review site dedicated to discussing music shows in the Bay-Area.